This is a nice species with long yellow or brown twisted spines, hooked at the tips. Origin and Habitat: Oaxaca: Mitla, Mexico. 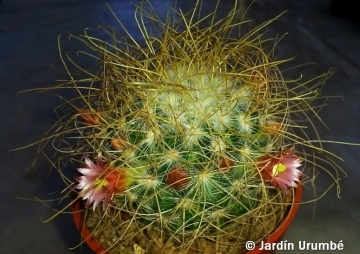 Description: Slowly clustering , at about 3 or 5 years old from seed. Stems: Globose to short, cylindrical, green, 12-13 cm tall, 5-6 cm thick. Sometimes with latex. Tubercle: Conical to cylindrical. The axil has short white wool and white bristles. Tubercle arrangement: 8-13. Radial spines: About 27-30, radiating, finely bristly, needle-like, white to golden yellow, 4 - 6 mm long. Central spines: 4-6, much stouter than the radials, yellow, amber or brown, hooked, sometimes twisted, 15-20(-25) mm long, the lower one sometimes strongly hooked. Flowers: Diurnal, purple, generally with darker midribs, up to 15 mm long. The petals flare back at the ends, rather than opening widely. 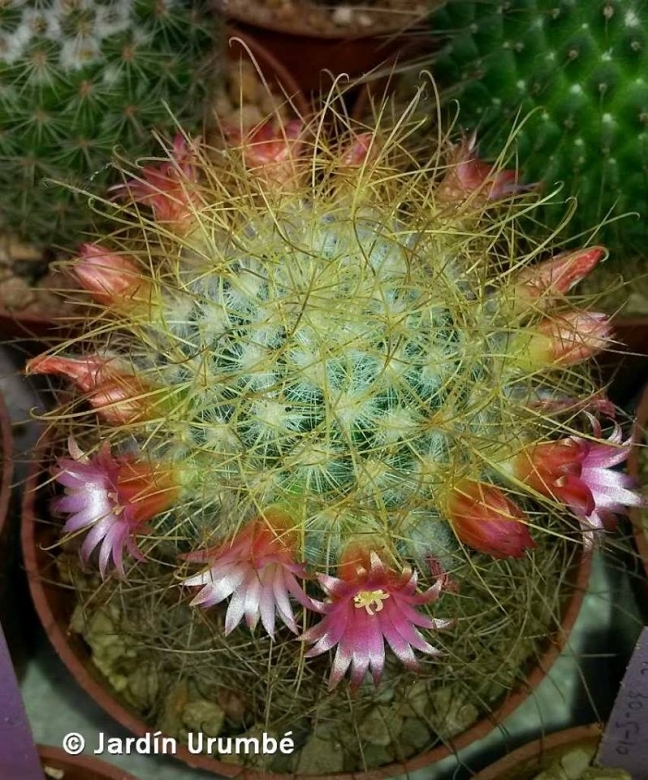 Mammillaria pullihamata Repp. : has central spines amber coloured, always hooked. Distribution: Portillo Nejapa, Oaxaca. Mammillaria rekoi (Britton & Rose) Vaupel: Always solitary with 4 centranl spines, the lower one hooked ( or sometimes straight) and about 20 white radial spines. Distribution: whidespread in Oxaca. Mammillaria rekoi subs. 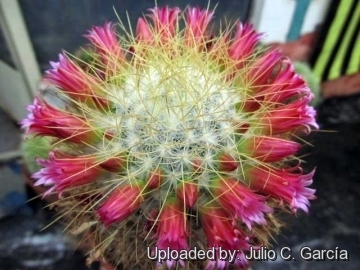 aureispina (A.B.Lau) D.R.Hunt: Solitary (occasionally with several stems) may reach 15 cm in height, and has 5-7 straight golden-brown central spines and 20-23 yellow radials; Distribution: north of Quiotepec and Yolox, Oaxaca. Mammillaria rekoi subs. leptacantha (A.B.Lau) D.R.Hunt: Clumping withof as many as seven stems. It has 4-6 curved and hooked central spines and 27-30 radials; Distribution: It is found between Mitla and Najapa, Oaxaca. 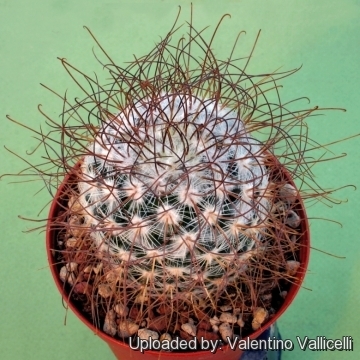 1) John Pilbeam (1999) “Mammillaria The Cactus File Handbook” Nuffield Press. Cultivation and Propagation: Mammillaria rekoi subs. leptacantha requires excellent drainage provided by porous cactus soil. Easily clustering, it's an easy bloomer. Growth rate: Most plants will offset readily, and clumps can be produced in a few years. Repotting: We suggest repotting every 2-3 years. Fertilization: During the beautiful season enrich the soil using a fertilizer rich in potassium and phosphorous, but poor in nitrogen, because this chemical element doesn’t help the development of succulent plants, making them too soft and full of water. Exposure: It prefers bright light and ample airflow. Outside full sun or afternoon shade, inside it needs bright light, and some direct sun. Moisture: Water the soil abundantly when it is dry to the touch. Allow soil to drain thoroughly before watering again. Do not water much in the winter (rot prone). Overwintering: Protect from frost. But it's hardy to -5°C if kept dry.